What is the EU newsletter? What is the Customized EU Newsletter provided by Euroalert.net? 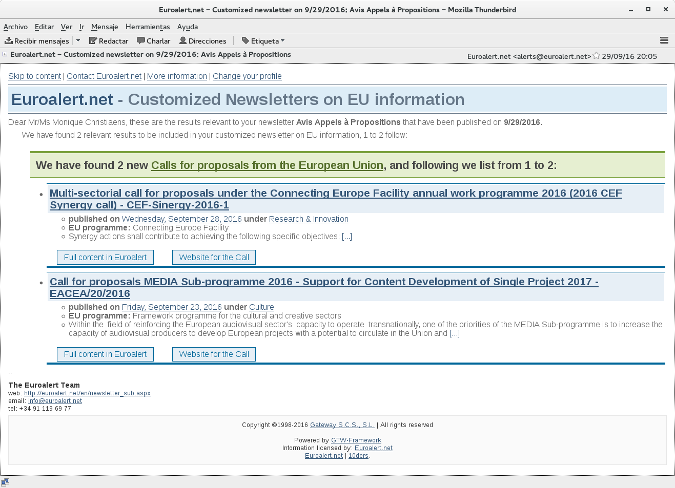 Thanks to this customized newsletter you will receive in your mailbox up to date information about news from the European Union, new funding opportunities for your projects through EU calls for proposals, as well as the legal provisions published in the Official Journal of the EU. By setting a profile with the contents and criteria which are relevant to your activity, you will get the most accurate results and receive only relevant information. Before deciding to take a subscription, you can test the Customized EU Newsletter for FREE during 10 days. You just need to sign up and fill in your profile. This registration implies no further obligation, and will allow you to check how the system works and make as many changes in your profile as you want. Then, if you decide to take a subscription, you can do so for the period you need, from one month for 29 € + VAT to one year for only 288 € + VAT. If you also have a promo code, do not forget to introduce it when you fill in your Contact details and you will benefit from special conditions. 1 Define your Euroalert profile: tell us the information you would like to receive by selecting the type of content or contents you want to track, the categories as well as relevant keywords for your search. If you need any assistance while completing the profile do not hesitate to contact info@euroalert.net or call us to +34 91 119 69 77. 2 Choose the delivery options: email address to receive the newsletter, language, maximum number of contents to receive in each email, etc. 3 Fill in your contact details: you only need to fill in your name, phone, email and a password so you can access as many times as you need to manage or change your profile. If you have a promo code, do not forget to introduce it in that step so you can enjoy special benefits.